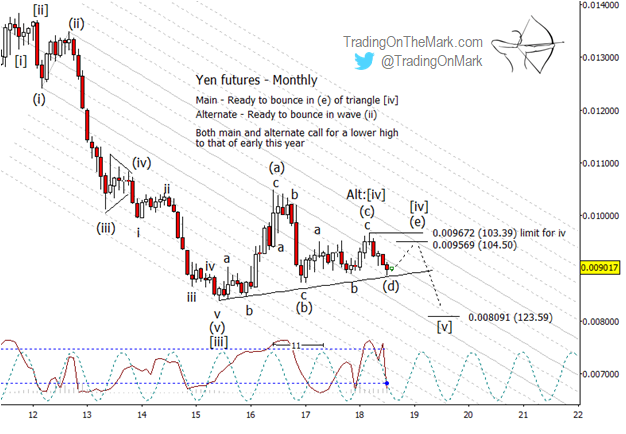 Yen futures have failed to break beneath pattern and trend line support this year, and the expected time window for the most recent downward move has almost closed. Here we describe two Elliott wave scenarios, both of which predict a bounce into the end of the year. The middle part of the middle segment was considerably stronger than other parts of the move. Throughout its decline price has responded to the boundaries and harmonics of a major downward-pointing channel that is anchored on a prominent first and second wave in the structure. None of the fourth waves in the structure have overlapped with their corresponding first waves. Treating the steepest part of the decline from 2012 to 2015 as wave [iii] in the impulsive sequence, price action since 2015 has behaved nicely as wave [iv]. The main question now is whether wave [iv] is complete. As our main scenario, we are treating the overlapping moves since 2015 as an Elliott wave triangle that is getting ready to embark on the upward and final leg (e). For that scenario to remain in force, price in the near term must not go beneath the low from late 2016 and early 2017. Leg (e) should be the shortest leg of the triangle, and the most likely resistance area for (e) to complete is near 0.009569 (or 104.50 for those tracking the inverse number). Meanwhile the level of the previous high (c) at 0.009672 (inverse 103.39) serves as a hard ceiling on how high (e) can travel without invalidating the triangle scenario. Using the dominant 11-month cycle as a guide, the cycles inflections suggest a turning point around now. Since the inflections are more important than cycle direction, it is reasonable to look for a low nearby and a high around spring of next year or sooner. The alternate scenario counts wave [iv] as having finished at the previous swing high in March 2018. A quick move beneath support would confirm that count, but we might not get that kind of confirmation. It is more likely that price will bounce from nearby in a way that could be interpreted as either an upward wave (ii) of [v] or an upward wave (e) of [iv] as described earlier as our main scenario.